The Outline View allows you to see maps using a familiar visual form so you can read and navigate through the document from top to bottom. 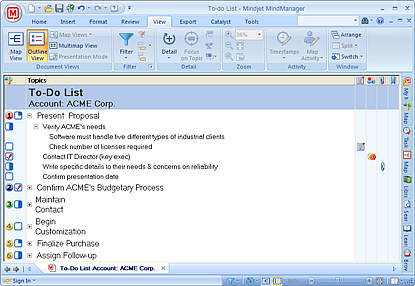 This view can be a helpful reference if you are just beginning to use MindManager. If you plan to use a linear export format, like Word or Project, the outline view can be used to preview the map in a linear arrangement so you can make any necessary adjustments before the export. If you print the map from this view it will be printed in outline form. See Print an outline for more info. You can use the Topic Numbering option to add numbers to your outline before you print it. Some map elements are not displayed in Outline View: Fill colors, Relationships, Boundaries, Task info, Images and Floating topics. On the View tab, in the Document Views group, click Outline View, or click Outline View on the Status Bar. Attachments column indicating whether the topic has Attachments. Right-click on any column heading to choose which columns you want to show or hide. Click on any of these columns to quickly add, remove or modify this information for the current topic. Use the Detail and Filter commands to control which topics are visible here. If you are viewing the map in Outline View you can choose a saved Map View to see the map in Map View.